Also known as the American Indian wars. The term describes a series of intermittent conflicts involving the native peoples of North America and the European settlers or the federal government between the years 1622-1924. Most of the fighting was the result of expansionist practices on the part of European settlers and the American government. Inter-tribal rivalries among Native Americans and competitive claims to the land among European nations added to the tension and the ongoing struggles. Due to uneven warfare technologies and organizational powers, the European settlers, and later the U.S. government, often had the upper hand in these wars, and the fighting, relocation, and removal ultimately led to a devastating loss of indigenous lives and lands, and the destruction of their cultures, languages, and traditions. 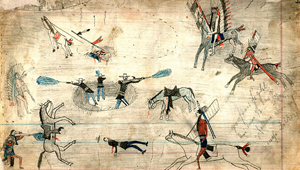 "A Kiowa ledger drawing the Buffalo Wallow Battle of 1874, one battle among the extended American Indian Wars," artist unknown is licensed under Public Domain. 2010 American-Indian Wars. http://www.history.com/topics/native-american-history/american-indian-wars, accessed November 26, 2014. 2013 Plains Wars. Encyclopedia Britannica Online. http://www.britannica.com/EBchecked/topic/1032848/Plains-Wars, accessed November 26, 2014.